Montreal ">[mɔ̃ʁeal]) officially Montréal in both Canadian English and French, is the most populous municipality in Quebec and the 2nd-most populous in Canada. Originally called Ville-Marie, or "City of Mary," it is named after Mount Royal, the triple-peaked hill in the heart of the city. The city is on the Island of Montreal, which took its name from the same source as the city, and a few much smaller peripheral islands, the largest of which is Île Bizard. It has a distinct four-season continental climate with warm to hot summers and cold snowy winters. Nickname(s): "MTL","Quebec's Metropolis", "The City of Festivals" "The City of Saints","The Metropolis", "The City of a Hundred Steeples", "Sin City"
Montreal (/ˌmʌntriːˈɒl/; [mɔ̃ʁeal]) officially Montréal in both Canadian English and French, is the most populous municipality in Quebec and the 2nd-most populous in Canada. Originally called Ville-Marie, or "City of Mary," it is named after Mount Royal, the triple-peaked hill in the heart of the city. The city is on the Island of Montreal, which took its name from the same source as the city, and a few much smaller peripheral islands, the largest of which is Île Bizard. It has a distinct four-season continental climate with warm to hot summers and cold snowy winters. In 2011 the city had a population of 1,649,519. 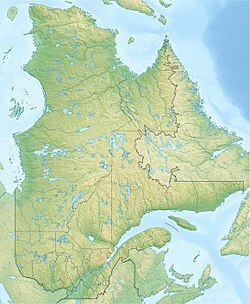 Montreal's metropolitan area had a population of 3,824,221 and a population of 1,886,481 in the urban agglomeration, with all of the municipalities on the Island of Montreal included. The 2014 estimate of the population of the metropolitan area of Montreal is 4.1 million. French is the city's official language and is the language spoken at home by 56.9% of the population of the city, followed by English at 18.6% and 19.8% other languages (in the 2006 census). In the larger Montreal Census Metropolitan Area, 67.9% of the population speaks French at home, compared to 16.5% who speak English. The agglomeration Montreal is one of the most bilingual cities in Quebec and Canada with 56% of the population able to speak both English and French. Montreal is the second-largest primarily French-speaking city in the world, after Paris. Historically the commercial capital of Canada, it was surpassed in population and economic strength by Toronto in the 1970s. It remains an important centre of commerce, aerospace, finance, pharmaceuticals, technology, design, education, culture, tourism, gaming, film and world affairs. Being the location of the headquarters of the International Civil Aviation Organization, Montreal is one of three North American cities home to organizations of the United Nations (along with Washington, D.C. and New York) and also has the 2nd-highest number of consulates in the continent. Montreal was also named a UNESCO City of Design. In 2009 Montreal was named North America's leading host city for international association events, according to the 2009 preliminary rankings of the International Congress and Convention Association (ICCA). The 2016 edition of QS Best Student Cities ranked Montreal the 7th-best city in the world to be a university student. According to the 2015 Global Liveability Ranking by the Economist Intelligence Unit, Montreal ranked 14th out of 140 cities.